Tips on how to choose the best greyhound for your family. Adoption do's and don'ts. Are you ready to make the commitment to keep this dog for the rest of its life? Greyhounds can live 12 to 15 years. Dogs are not disposable and should be looked on as family members that would never be abandoned. Do you have the time and energy to provide your dog with attention and a walk every day? Even a big house with a beautiful yard can be a prison. Dogs enjoy getting out like you do. If you are planning to have children in the future, will you continue to set aside time for your dog? Many, many dogs are abandoned because of a new addition to the family. Most greyhounds are wonderful with babies. If you have small children are you willing to always supervise the dog and children when they are together? Most greyhounds are excellent with children but when the rare bites do occur they are nearly always when children and dogs aren't supervised. If you have small children are you willing to train them how to act respectfully around dogs? No hitting, hugging, poking, staring at, or crawling on dogs. Most importantly "Let a sleeping dog lie!" and "Don't bother a dog when it is eating or is chewing on a bone!" Are you prepared to work with your dog and seek professional training if it develops behavior problems? No dog is perfect. Most problems are easy to fix if you ask for help at the first sign of trouble. We provide a Facebook Group where you can go for advice. If you have to relocate, are you willing to find a place to live that will accept dogs and take your dog with you? Many dogs are rehomed simply because their family chose not to spend time looking for an apartment or rental that would take large dogs. There are many in the area that will take greyhounds and even multiple pets. Please ask us for suggestions. Is having a canine companion more important to you than keeping a spotless home? Even clean greyhounds have accidents, get sick occasionally, shed and have muddy feet. As they age some suffer incontinence. If you travel frequently, are you willing to stay at dog friendly hotels with your dog or are you financially able to pay for your dog to be kenneled while you are gone? Do you really have enough time to spend with your dog? Do you have the financial resources to care for a dog's basic needs including yearly vet visits, dental cleaning and vaccinations? How about monthly heartworm preventative and flea and tick preventative? We recommend about 4 cups of high quality dog food a day for a greyhound which can add up quickly. Do you have funds set aside for expensive emergency care? If you do not have a fenced yard, are you willing to leash walk your dog 4 to 5 times a day to eliminate, rain or shine? Even when you aren't feeling well? If you have children, are they old enough to be left unsupervised while you are walking the dog? If you work long hours or are likely to get a promotion within the lifetime of the dog that will require long hours, are you prepared to hire a dog walker or install a doggy door? We don't want to get your family member back because of a schedule change. While it is honorable to want to adopt a dog, sometimes the best decision is to wait to adopt if you honestly can't answer "yes" to all of these questions. You can still help out greyhounds by volunteering until you are ready to adopt or by making a donation. Having to rehome a dog is heartbreaking for your family and the dog. Greyhound Crossroads always takes our returned dogs back no matter what the reason, but our goal is for every adoption to be FOREVER. 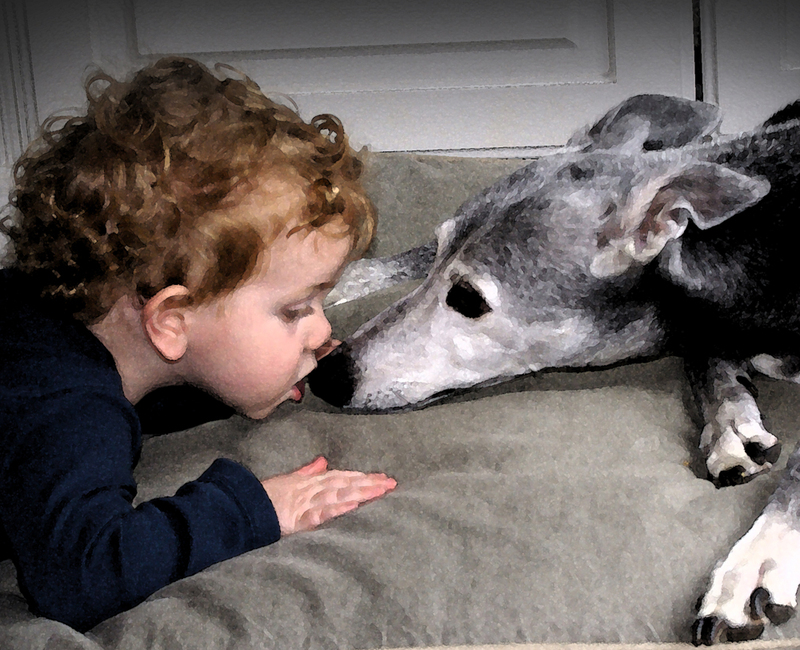 We are committed to finding the right greyhound for your family. Here are some things to consider when choosing a dog. Listen To Your Adoption Rep! We have been matching people with greyhounds for years. Your adoption rep will do their best to find the right dog for you based on what you tell them and what they have observed when meeting your family and pets. Our adoption reps will tell you the good and the bad about each dog. We believe it is better to be honest about a dog's behavior (good and bad) upfront so we don't get it returned to us later because of it. Energy Level: Greyhounds are famous for being couch potatoes but some are more energetic than others. If you are a low energy person or too busy to walk a dog frequently, ask for a low energy greyhound. Greyhounds mature out of the puppy stage and calm down between 2 and 3 years old, so greyhounds over 3 years old are generally the best bet for mid to low energy people. Greyhounds seem to calm down even more at around 6 years old. A very low energy owner may do best adopting one of these mature greyhounds or a special needs dog with exercise limitations. We do see greyhounds that are exceptions to these rules, so be sure to ask your adoption rep and the dog's foster home. If you are a higher energy person that jogs or hikes and wants a dog that can keep up, look at our younger dogs and our higher energy dogs. Energy level is so important! If you can't drain your dog's energy, it will be forced to find ways to drain it himself like chewing, digging, barking or any number of other unacceptable behaviors. Your Personality: Are you a confident, outgoing person or more of a follower or unsure of yourself? Dogs are very sensitive to the energy you project. A dominant, confident dog often tries to make his own rules if the human isn't a natural leader. If you aren't the leader type or don't have much dog experience, ask for a dog that is more submissive and easy going. Avoid the pushy, dominant types unless you are experienced with dogs and confident in your leadership abilities. Very shy, timid dogs that weren't properly socialized as pups do better with a confident owner, that is not a worrier. If the owner is unsure, nervous, anxious or timid, shy dogs can pick up on that and become more afraid. The Greyhound's Personality: Pick a dog that has the personality you want when you meet it. Greyhounds can vary between very outgoing to the point of being almost bothersome, to a little standoffish, to nervous and terrified of everything. Don't expect the dog's behavior to change much. Sadly we have gotten shy dogs back after a month or two because they didn't magically become outgoing, friendly dogs. A dog that runs up to you and jumps on you, isn't necessarily "picking" you and may continue to jump on you, your children and guests, without training.That behavior can be a sign of a higher energy dog that may be pushy or hard to handle for an inexperienced owner. Calmly friendly, laid back dogs are best for most adopters. If you aren't an experience dog owner let us know that you want an easy dog. Your Children: If you have children pick a dog that has been fostered with children or has at least been evaluated around children. Take your children to meet the greyhound to make sure they and the dog are comfortable with each other. Other Pets: If you have small dogs or cats choose a greyhound that has been fostered with an animal similar to yours or is listed as "tolerant" or "trainable" with cats or small dogs on our website. Dogs listed as "trainable with cats" MAY be OK but will need more supervision and further training with them at first. Dogs listed as "not safe" with cats or small dogs should not be adopted by owners with those animals. Often dogs that are not safe with cats are perfectly fine with small dogs, because they can spot another dog by the smell. It is pretty rare to meet a greyhound with a high enough prey drive that they can't live with small dogs. Greyhounds may need a careful introduction to any small animals because they don't have any experience with them and aren't likely to know at first glance what they are. Please bring your current dogs to meet the greyhound. A cat or small dog test is just a test with one cat or small dog. Animals are unpredictable, so it is very important that YOU introduce your new greyhound carefully to your pets and others that you meet using the methods we recommend on our Cats and Greyhounds page. Supervise very carefully at first even if your greyhound tested tolerant. If you do not have small animals PLEASE consider adopting one of our greyhounds that is higher prey drive and can't live with small animals. Because most of our adopters have cats or small dogs, these dogs often end up stuck in foster care for months or even a year before adoption. Male or Female? The personality of males and females is similar but we think the males tend to be a bit goofier and needier and females can be a little more aloof. It all depends on the individual dog though. Marking is sometimes a concern with males, but many males never mark. Some females mark too. Males seem to be just as easy to potty train as females and maybe even easier because you can use a belly band during the potty training process. Because male greyhounds usually pee small amounts in a lot of places, they are less likely to kill your grass than females who empty their bladder in one spot. Males are generally a little larger than females. With recent track closures there are fewer dogs racing and just not enough females to go around to all the adoption groups that want them. With the shortage of girls it is likely to take longer to get a girl and you may have to take what comes in rather than meeting several. Please consider meeting some of our sweet males. Be willing to travel to get the best match! We have fosters in 3 states. Being willing to drive long distances to find the right dog makes you much more likely to find him. Our foster homes are never expected to deliver dogs to adopters that aren't willing to drive to meet a dog. DON'T pick a dog by color. You will be much happier if you pick the dog that has the energy level and personality that is best for you. Darker color dogs are naturally intimidating to some people. 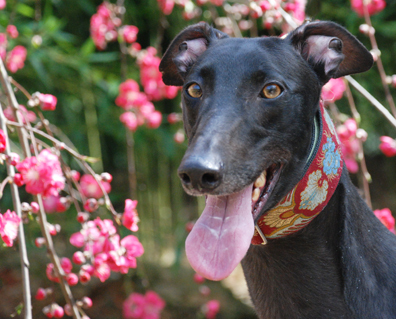 Don't overlook the perfect greyhound because he is a dark color. Color does not effect personality. Did you know that black dogs of any breed take the longest to find homes? Because people tend to overlook black dogs, you are often able to find a real gem by being willing to consider one. DON'T pick a dog by size. Assuming a smaller greyhound will be easier to handle than a larger one is a big mistake. Many of our tiniest girls have been the most difficult to walk on leash and the highest energy. Lower energy dogs will always be easier to handle than a high energy dog regardless of size. In most cases the larger the dog is, the lower energy and calmer it is. Don't pick a dog with behaviors that are likely to annoy you later. People will often choose a dog that is jumping on them because they believe it "likes" them. Those dogs are sometimes returned later because they jump on children and guests. If you don't want a dog on the furniture don't adopt one that already sleeps on the couch or the bed. Our foster homes will be honest with you about the dog's behavior, good and bad. Pick a dog with behaviors you can deal with and don't expect to change it much unless you are already experienced at dog training. DON'T pick a dog because you feel sorry for it. We occasionally have dogs that are genetically shy or were not socialized as puppies that are terrified of everything. Some big hearted people are drawn to these dogs without really understanding how long it will take for these dogs to act "happy". These spooky dogs take months if not years of work to become "normal" dogs, if they ever get to that point. If you want a dog that will happily meet you at the door, pick a dog that is like that to begin with. If you are OK with a dog that hides, doesn't interact much and doesn't wag or even act happy to see you, then please give one of our spooky, shy greyhounds a chance. DON'T hurry. If a greyhound that matches your needs isn't available now, wait for the right one. We get new dogs about every 2 weeks. We can special order dogs from the trainers at the track that know them well. If we don't have what you need, we will do our best to find it. DON'T pick a dog by its photo! A great photo can catch your attention and draw you to the wrong dog because it seems to speak to you. An unflattering photo can often keep the perfect dog from being considered. Read the dog's description and talk to your adoption rep and pick the best dog for you. Photos show the photographer's skill more than the true beauty and personality of the dog. We have yet to meet an ugly greyhound.